Satpreet Kahlon uses base materials that build upon each other through small accumulated gestures. 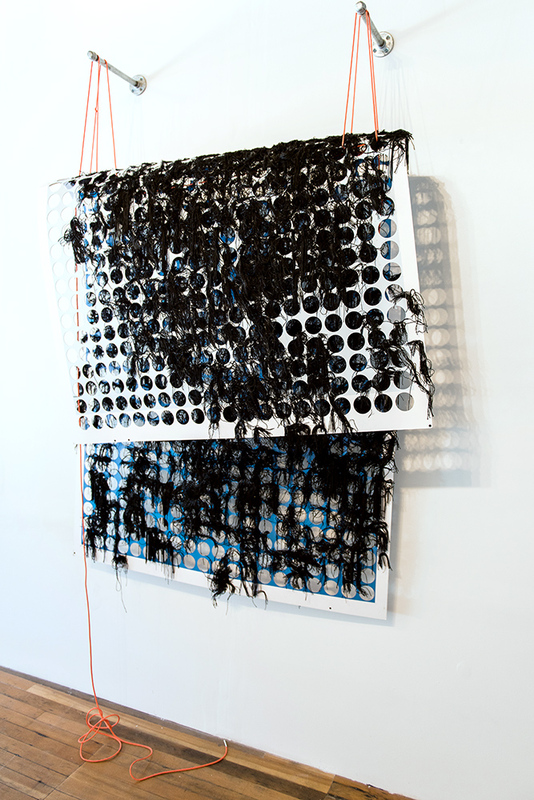 The resulting works are both delicate and disconcerting referencing the body, hair, and the earth. Working from her experience as a first generation woman of color, Kahlon examines and recreates the tension found between discordant systems. In this exhibition three new large-scale works pair a material language of purpose and industry with an appearance of non-functionality to suggest uses and systems beyond the viewer’s comprehension. Repetitive actions found throughout Kahlon’s process serve as a record of meditation on identity, the body, and finding agency within marginalized social spaces. This small body of work explores the inherent tension between two discordant systems that are forced to reside within the same space and context. By using domestic craft materials that evoke body, hair, and earth, and combining them with rudimentary industrial materials, I hope to evoke a sense of non-belonging and discomfort, the same emotions that are inherent in my existence as a first generation woman of color living in the United States. My experience forces me to find and create intersections in two cultures that sit in opposition with one another. It is in these created intersections that a third culture, a marginalized and misunderstood culture — my culture — exists. Similarly, these objects serve as relics of a third system that is created at the meeting of industry and domesticity. Outwardly, they are objects that seem to serve no decipherable function, and yet their material language indicates a sense of purpose and industry for a system that the viewer may not have a point of reference to understand or know, a system that continues to exist regardless.